Derived from certified renewable wood sources using an eco-responsible production process by meeting high environmental standards, LENZING™ ECOVERO™ fibers tailor to a sustainable lifestyle, contributing to a cleaner environment. The introduction of LENZING™ ECOVERO™ branded Viscose fibers marks a new milestone in Lenzing’s sustainability journey. LENZING™ ECOVERO™ branded Viscose fibers give you confidence your fashion choices are environmentally responsible and have a low environmental impact. LENZING™ ECOVERO™ Viscose fibers are derived from sustainable wood and pulp, coming from certified and controlled sources. LENZING™ ECOVERO™ fibers have been certified with the EU Ecolabel as meeting high environmental standards throughout their life cycle: from raw material extraction to production, distribution and disposal. LENZING™ ECOVERO™ fibers can be robustly identified in the final product, assuring you that your purchase contains genuine ECOVERO™ Viscose fibers. The manufacturing of LENZING™ ECOVERO™ fibers generates up to 50% lower emissions and water impact compared to generic Viscose. ECOVERO™ fibers are produced using pulp, which is derived from the renewable resource wood as raw material. Lenzing purchases wood and pulp derived from responsibly managed forests and certified to come from sustainable sources. A special manufacturing system enables LENZING™ ECOVERO™ branded Viscose fibers to be identified in the final product, even after long textile processing and conversion steps through the value chain. Environmentally conscious consumers can be assured that retailers and brands are incorporating genuine LENZING™ ECOVERO™ eco-responsible Viscose in their products. You can be assured that your fashion choices are sensitive to environmental concerns. Manufactured only from certified and controlled wood sources and produced with significantly lower fossil energy use and water than generic viscose, LENZING™ ECOVERO™ branded Viscose fibers are certified with the internationally recognized EU Ecolabel. 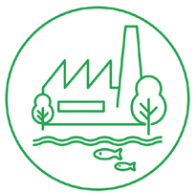 This label of environmental excellence is only awarded to products and services, which have a significantly lower environmental impact throughout their lifecycle: from raw material extraction to production, distribution and disposal.